It’s in the news every day: sedentary desk jobs can be hazardous to your health. 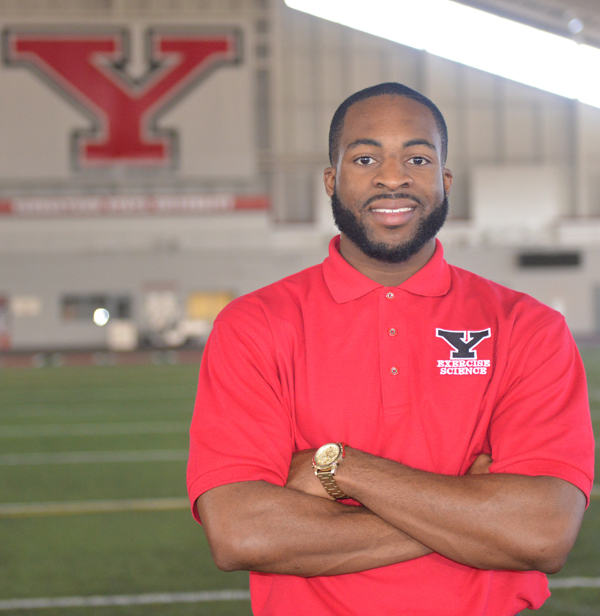 That’s why Youngstown State University senior Emeka Obinnakwelu Jr. dedicated this semester to helping YSU employees get active. Obinnakwelu, an exercise science major serving an internship in the university’s Employee Wellness Program, devised a lunch hour campus walking regimen, serving as advisor, encourager and exercise consultant for the 41 faculty and staff participants. In the eight-week Wellness Walker program he created, participants signed up to walk anytime between 11:30 a.m. and 1 p.m. on Tuesdays and Thursdays at the WATTS, YSU’s indoor training center. Obinnakwelu’s family lives in Union, N.J., about 30 minutes from New York City – his parents emigrated here from Nigeria, but he and his three siblings were born in the United States. His younger brother, a freshman, is also studying at YSU. Obinnakwelu came to the university on an academic scholarship and regularly makes the Dean’s List. He’s been involved in Student Government and is active in the Golden Key International Honor Society and the National Society of Collegiate Scholars.